Alexandria Ocasio-Cortez and Bernie Sanders’s social media videos are putting class struggle front and center. Over the past week and a half, Alexandria Ocasio-Cortez’s impromptu Instagram videos have become a hit. Major publications have marveled at her ease in front of the camera and her genuine, relatable manner — whether she is touring the Capitol or doing laundry and making dinner. We should commend Ocasio-Cortez for making herself so accessible to average people while showing that she is one. Doing chores dressed in sweats, she fielded questions from viewers on matters like a federal jobs guarantee, reforms to labor law, marijuana legalization, and her thoughts on challenges to Nancy Pelosi’s bid to regain the House speakership. Her intelligence and nuance in speaking off the cuff is a stark and welcome contrast to the usual meaningless soundbites we hear from most of the political class. 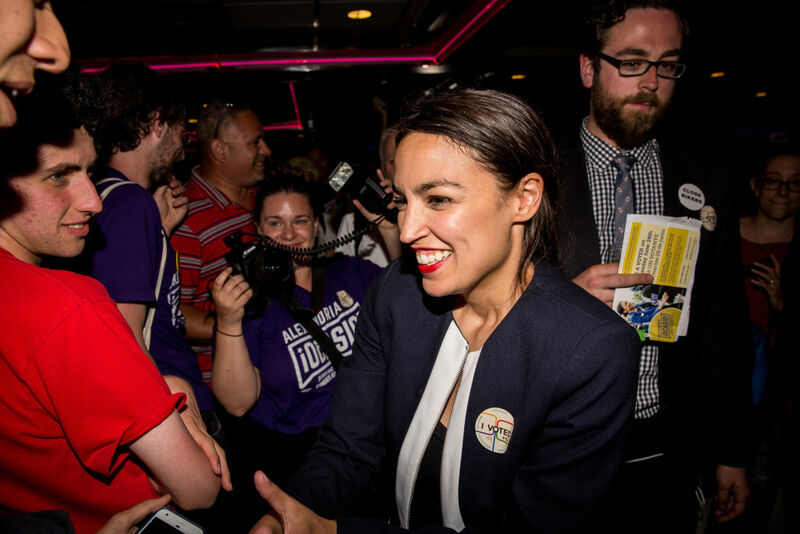 Increasing the number of women, people of color, young people, and working-class people in Congress is unquestionably important, and we should support Ocasio-Cortez to the extent that her depiction of herself and her cohort advance that goal. But there is also a real danger in making Congress and the political class appear more accessible or “relatable” than they really are. Reliable demographics for the incoming Congress have not yet been published, but the current Congress is nearly 80 percent male and nearly 80 percent white, with an average age of fifty-eight in the House and sixty-two in the Senate. The median net worth for members of the House was $900,000 in 2015; for senators, $3.2 million. The vast majority come to office with significant help from capitalists and corporations, both via direct campaign donations and Super PACs. We should not obscure the fact that the political sphere is, objectively, a scary and alien place for the average person — by design. Counterexamples like Ocasio-Cortez, Rashida Tlaib, and others are welcome, but one or two or a half dozen members of Congress won’t change a political system rigged against working people in every way. And we should want socialist legislators to foreground not themselves, but the working-class people they represent. Fortunately, it appears that Ocasio-Cortez realizes this. On Saturday, one of the biggest retail traffic days of the year, she released a Bernie Sanders-style video, in which she interviews laid-off Toys “R” Us workers in the Bronx. The video is notable for how it addresses class struggle head on. Workers tell stories of working conditions steadily deteriorating until they lost their jobs altogether, followed by their bosses denying them promised severance pay. The workers subsequently won about $20 million for a severance fund for around thirty-three thousand workers. But workers and advocates claim they are owed at least $75 million. The video runs across the screen the names of the heads of venture capital firms and lenders responsible for shutting down Toys “R” Us, noting how much each has paid to the workers’ severance fund. As we might expect, most have contributed nothing. Sanders has been producing class-struggle videos and posting them online regularly since early 2017. Many of the videos are wildly popular, with some of the live town hall–style events receiving more viewers than cable news programs running at the same time. Sanders is reportedly obsessed with the videos’ view numbers, frequently asking staff how recent videos are being received. According to a story in New York magazine, Sanders himself only appears in about a quarter of the videos. And in many of those in which he does appear, his presence is minimal. Like Ocasio-Cortez’s video, many of Sanders’s pieces explicitly attack large corporations and showcase workplace struggles, with full playlists dedicated to “Faces of Greed,” “Amazon,” and “CEOs vs Workers.” Ocasio-Cortez’s video is reminiscent of Sanders’s recent video reporting on workers fired after a unionization campaign in Georgia, as well as his campaign video from 2016 telling the story of the horrible working conditions agricultural workers in Florida face. Both Ocasio-Cortez’s Toys “R” Us video and Sanders’s playlists approach class very differently from the typical Democratic paradigm. Most Democratic politicians follow two tactics when talking about the working class. They either find a single, token worker with a compelling personal story to serve as a prop before turning the spotlight back on themselves, or else they talk about class status as a sort of personal problem to be transcended through hard work. This is no doubt in part because both Democratic politicians and voters are increasingly coming from among the very rich. The Toys “R” Us video and much of Sanders’s media work make a very different point: the rich are rich because the poor are poor, and there is something workers themselves can do to improve their conditions. The popularity of these videos demonstrates an opening for socialist officeholders and candidates to make that argument to millions of people. Such videos are popular precisely because they speak directly to working people’s everyday concerns. Informal videos and interactions that make elected officials more accessible to everyday people are a positive thing. Even better is showing working people that they are not alone in struggling to get by, and that they have power if they organize together. There is very little coverage of labor organizing in the mainstream press, and what little there is generally focuses on high-level union officials. But the press is generally eager to cover elected officials in great detail. By using their pulpit to demystify workplace organizing, socialist officeholders can help fill this gap. Class-struggle messaging from elected officials can inspire more workplace struggles and bring greater class-consciousness to workers. And a greater level of class struggle can, in turn, empower elected officials to push harder against the limitations of elected office. Eventually, when class conflict reaches a much higher level, electoral and workplace struggles will have to merge in order to transform the state. We’re far from that point. But by using the state’s resources and the attention they garner from the media to showcase workers’ self-organization, socialist officeholders like Ocasio-Cortez and Sanders can help move us in that direction.